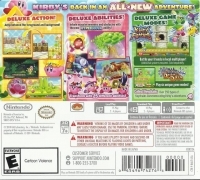 Box Text: KIRBY'S BACK IN AN ALL-NEW ADVENTURE! Jump between the foreground and background! Inhale massive enemies and obstacles with the new HYPERNOVA ability! Transform with 25 different abilities! Battle your friends in local multiplayer! Additional systems required. Sold separately. Play six unique game modes! Over 250 types of keychains commemorating Kirby's adventures. 04-16-2016 mrfoxhound Box Text KIRBY'S BACK IN AN ALL-NEW ADVENTURE! DELUXE ACTION! Jump between the foreground and background! DELUXE ABILITIES! Inhale massive enemies and obstacles with the new HYPERNOVA ability! Transform with 25 different abilities! DELUXE GAME MODES! Kirby Fighters Battle your friends in local multiplayer! Additional systems required. Sold separately. Dedede's Drum Dash Play six unique game modes! Collect keychains Over 250 types of keychains commemorating Kirby's adventures. 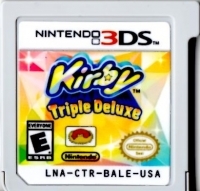 This is a list of VGCollect users who have Kirby: Triple Deluxe in their Collection. This is a list of VGCollect users who have Kirby: Triple Deluxe in their Sell List. 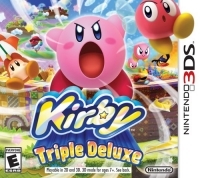 This is a list of VGCollect users who have Kirby: Triple Deluxe in their Wish List.